I HEART Foie Gras. I HEART Truffles. Put them together? Just pure heaven! 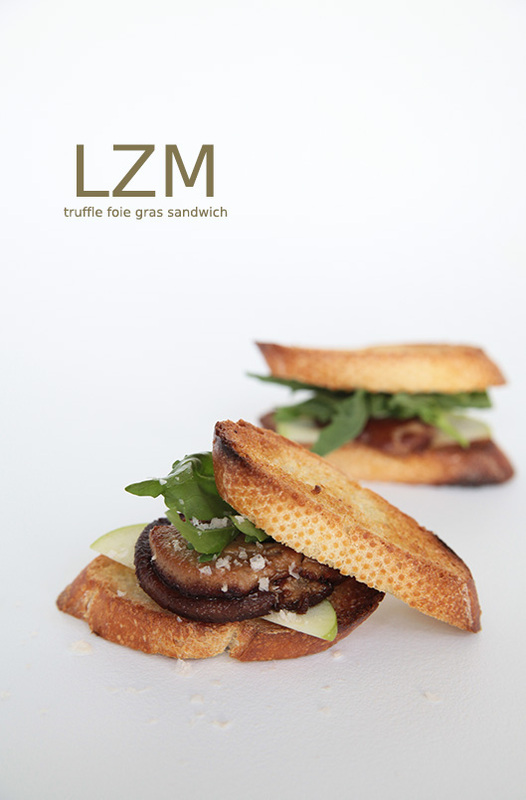 Yesterday, as a snack, I made two little seared Truffle Duck Foie Gras sandwiches. It was just the perfect midday filler. Seared Foie Gras in a way reminds me of Roasted Bone Marrow which I LOVE to make. Will share my RBM recipe later. If you don’t have Australian salt flakes, sea salt works just as fine. Green apple slices and arugula cuts the fat. Searing the foie gras too long will just melt away all the fat. You want to do this quickly on high heat. I used a cast iron skillet. Prior to toasting the baguette, I rubbed it with an olive oil/crushed garlic concoction. Have you tried Foie Gras? This looks wonderful! So decadent!! You are making all of us Californians drool with jealousy (and sadness) that we can’t have that great looking sandwich. Personally i am a die heart fan of Foie Gras, apple and Foie Gras is one of the very classic combination as apple has a hint of sourness with sweetness in it therefore it balanced out the richness and fattiness of Foie Gras. It is also a very good idea to have it with bread, toast, rice; sushi and fried with rice, this is because it acts as a sponge to absorb the excess fatty essence. There is nothing that eating excessively will do good to the human body, however eating with moderation is a different scenario. Here is a link which explain and advise the portion and nutrient of Foie Gras. This looks delicious. The photography is very nice, and no pun intended, tasteful. Do you shoot it yourself? Most decadent (and delish) sandwich EVER! Okay, this has to be the most elegant blog I’ve seen. I never try Foie Gras. I’ve always wanted to try roasted bone marrow. I’m curious to see your recipe (and no doubt gorgeous pictures! ).